Today's modern anesthetic monitors have made surgery much safer than in the past. 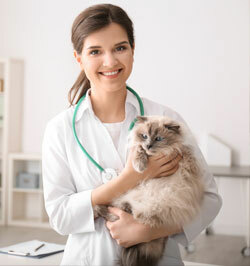 Here at Nanuet Animal Hospital, we do a thorough physical exam on your pet before administering anesthetics, to ensure that a fever or other illness won't be a problem. We also adjust the amount and type of anesthetic used depending on the health of your pet. The handout on anesthesia explains this in greater detail. We offer in-house blood testing the day of surgery or a comprehensive screen sent out at least 24 hours before surgery. Our doctors prefer the more comprehensive screen, because it gives them the most information to ensure the safety of your pet. For geriatric or ill pets, additional blood tests, electrocardiograms, or x-rays may be required before surgery as well. Because cats are unique creatures, we are limited in what we can give them. Recent advances in pain medications have allowed for better pain control in cats than ever before. After surgery, pain medication is chosen on a case by case basis.